The 2019 HNC Touch-a-Truck is quickly approaching! This great Holliston tradition and major source of fundraising is in jeopardy of not being held this year. We desperately need your help! We need three or more people to co-chair this event. The first two people to sign up to chair the event will receive a $50 Amazon gift card. Bring your kids today and have a blast together. This is an exciting year for the club, as we turn 50 years old in the spring! If you like to party and have awesome ideas, or simply want to help in planning behind the scenes, please drop us a line at HNCexecutiveboard@gmail.com. We’re kicking off January with a general meeting, so we can chat with members and share ideas and drinks together. We’d love to get to know you better, so please mark your calendars for Wednesday, January 23rd at 7:30 pm with the location TBD. Your opinion matters, and we’d love to make sure you have an opportunity to shape the upcoming year or just listen to what we have in the works. As President, I want you to know that this is your club and you can help shape it into the future. The Holliston Newcomer’s Club is pleased to announce its first annual Rock & Roll Bingo event March 30, 2019 at 7:00pm at Christ the King Lutheran Church in Holliston. Rock & Roll Bingo is a modern twist on a classic game that replaces the standard bingo format with popular music clips. Instead of calling out numbers, a DJ plays clips of music for 20-30 seconds until everyone identifies the song and stamps the corresponding box on the bingo card. In addition to dancing in your seats and singing to the music, this fundraising event will have a live and silent auction and raffle prizes! Please join us at Soul Spirit Studios (next to Coffee Haven) for a Mommy and Me Music Class for all ages. Music and fun for all! Halloween trick or treating here was so fun, we want to do more! We will have snacks and make fun Valentine crafts with the residents at Mission Springs to spice up our winter months. RSVP for both events on Facebook or e-mail juliannecatlin@gmail.com. 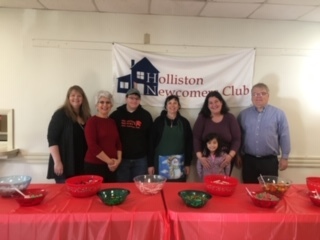 The 2018 Gingerbread House Grant Fundraiser was a huge success this year with help from Mount Hollis Lodge, the National Honor Society, and the many Holliston Newcomers Club members who donated candy and their time! Over 70 decorated houses adorned the lodge hall over three fun sessions. We wish to give a special thank you to our volunteers who helped make this event such a success! Excited guests young and old walked into the Lodge to tables of fresh houses. They then went to our candy station where they chose an assortment of goodies to adorn their house. This year there were also giant Gingerbread men to add to the festivities and decorate. Not only is it fun to beautify one’s own house, but it’s also a treat to see the creativity of others. 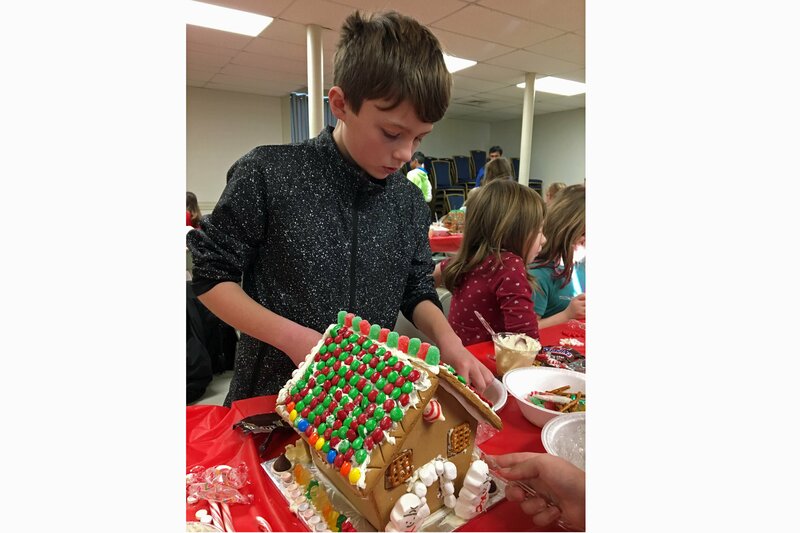 The atmosphere is not only jolly, but exemplifies the spirit of the season as the money raised is given right back to the community. 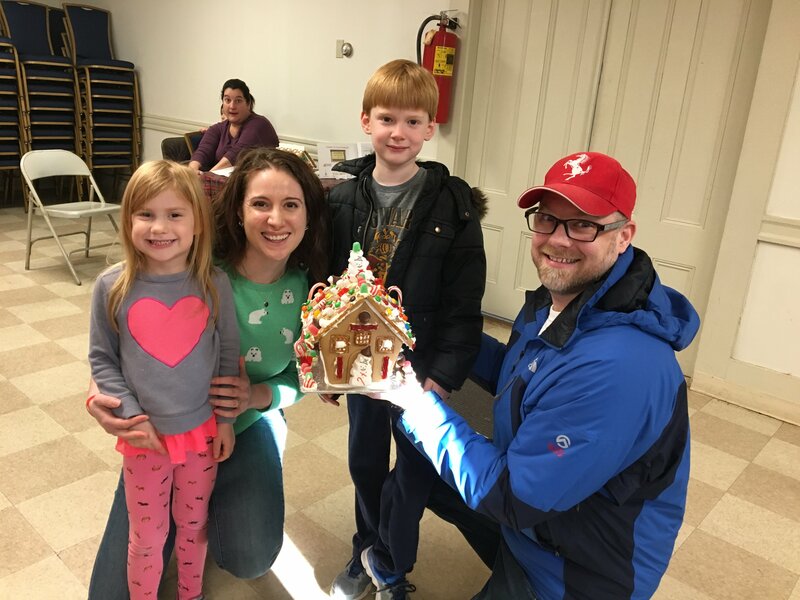 The Langlois family of Hopkinton came back for their second year in a row, as it has become a tradition to which they look forward. Tess 5, Theo 7, and their parents, Gayla and Steve Langlois. For the Wegrzyn family this was their fourth year attending the festivities. “We love this event and we look forward to it every year!” said Kerrin. This is one of the many events that fund the Newcomers Community Grants. Some of the 2018 grant recipients were the Holliston Fire Department’s personal CO2 monitors, Parks and Recreation Summer Concerts in the park, discounted library museum passes, and the Senior Center vegetable garden, among others. Thanks to all of our decorators for helping us to give back to Holliston! We’ve had a fun and busy fall, and now we’re looking ahead into 2019. We still have a number of open positions that need your help, notably, two additional co-chairs for our brand new Rock ‘n’ Roll BINGO fundraiser, one more co-chair for our Princess and Superhero Party and four co-chairs for Touch-a-Truck. Robin Bowman is bringing a fun new adult event to our town, Rock ‘n’ Roll BINGO, on Saturday, March 30th. She attended a similar event and it was a ton of fun. If you would like to put your own touch on this please reach out and partner with Robin. She’s already done a lot of the groundwork so if you’d like to gain valuable experience in event planning, here’s your chance! The second annual Princess and Superhero Party is scheduled for Saturday, April 6th, and two of the chairs, Katrine and I, did it last year so you’ll be in good hands if you join us. Lastly, our beloved Touch-a-Truck has been lovingly chaired by Leah, Angela and Christine the past two years and has grown in attendance and success thanks to their creative ideas and dedication. They will still be around to advise and help along the way, so if you’d like to learn more about what goes on behind the scenes please reach out and continue this fun and important event. Please email President@hollistonnewcomers.org or HNCExecutiveBoard@gmail.com if you are interested in any of these positions. Please keep in mind, this club is only as strong as its members make it, and we have a lot of great people already running things, but need to see new faces in the mix. Why not you? I hope you enjoy the magic of the holiday season, and I look forward to seeing you soon! The HNC Book Club will take a December break and reconvene on Tuesday, January 15 at 7:30pm for a discussion of, Tell Me More: Stories about the Twelve Hardest Things I'm Learning to Say by Kelly Corrigan. Please plan to join us then, location TBD. Copies of the book will be on reserve at the library circulation desk and available for checkout mid-December. Members are reminded that Book Club has its own Facebook page where you can stay up-to-date with current selections. In order to gain access, you must request to join. Send your request directly from the HNC page. New participants are warmly welcomed at any time. "Tell Me More is a funny, wise and insightful exploration of seven sentences adult life requires. With Kelly's signature candor and good will, each chapter draws from her sometimes ridiculous, sometimes profound struggles with parenting and marriage, career and friendship, illness, aging and mortality. Each chapter is animated by poignant, hilarious stories from Kelly's own life and is focused on one of seven sentences: Onward, a one-word sentence that celebrates the moment we stop raging against people and situations that will not be changed and decide to just get on with it. I Don't Know, a candid and liberating statement to help us make peace with uncertainty, unknowns and unknowables. Tell Me More, a prompt to squelch our instinct to fix, fix, fix ... and just listen. No, a mighty two-letter sentry against dangers of all sorts, including martyrdom. You Got This, an empowering message that honors, embraces and possibly multiplies personal capacity. I Was Wrong, a deep dive into how to apologize and the astonishing corrections a perfect apology can make possible. You Can Go, for the excruciating moment when it's time to say goodbye to someone you hardly think you can get through a day without"
Thank you all for a great 2018 with Children's Activities! We do not have a December event planned, as everyone is busy with the holidays, but we're working on a possible music class, more events at Mission Springs, and much more for the New Year. If you have any ideas or suggestions for future events, please feel free to let us know. Happy Holidays to you and all of your families!